This is bike safety 101. 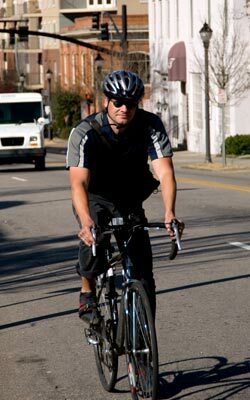 A majority of deaths in cycling accidents might have been avoided if the individuals involved had worn helmets. A helmet can save your life, and it is always worth wearing—no matter what. Regardless of whether you are cycling at night or during the day, making yourself visible to other motorists is incredibly important. If you are riding at night, it is in your best interest to wear a reflector badge, as well as brightly colored clothing. Most cyclists do not realize that it is required by law in most places to have a front headlight on your bike if you are riding at night, so make sure that your bike is equipped with one that is bright and can easily be spotted by other motorists. Learning the basic hand signals that indicate whether you are turning left or right takes little effort, and it can save you from getting into an accident. As stated earlier, most motorists do not pay attention to cyclists, which is how most accidents occur. By making the proper hand signals and gestures, you can let other motorists know when you intend to merge into a different lane or turn at an intersection. Many cycling accidents occur at intersections, so learning hand signals can help to significantly reduce your chances of getting into an accident. Another common hazard involving motorists and cyclists arises when a cyclist is riding on the wrong side of the road. An unsuspecting motorist could make a turn at an intersection and accidentally hit the cyclist. While most accidents involving bikes are the fault of motorists, cyclists can also be at fault sometimes, which is why it is incredibly important that you adhere to all traffic codes and regulations. You should always ride with the flow of traffic, as this will allow you to remain visible and prevent you from being in someone’s blind spot. Remember, even though most cycling accidents are caused by careless motorists, it is still up to you to be safe and follow the rules of the road. Doing so will not only keep you out of danger, but it can also save your life. Remember to wear a helmet, make yourself visible to other motorists, and never ride against the flow of traffic!